The British and Irish Lions is a rugby union team selected from players eligible for any of the Home Unions and Ireland – the national sides of England, Ireland, Scotland and Wales. The Lions are a Test side, and generally select international players, but they can pick uncapped players available to any one of the four unions. The side tours every four years, with these rotating among Australia, New Zealand, and South Africa. The 2009 Test series was lost 2–1 to South Africa, while the 2013 Test series was won 2–1 over Australia. From 1888 onwards combined rugby sides from the United Kingdom of Great Britain and Ireland toured the Southern Hemisphere. The first tour was a commercial venture, and was undertaken without official backing. The six subsequent visits enjoyed a growing degree of support from the authorities, before the 1910 South Africa tour, which was the first tour representative of the four Home Unions. In 1949 the four Home Unions formally created a Tours Committee and for the first time, every player of the 1950 Lions squad had played internationally before the tour. The 1950s tours saw high win rates in provincial games, but the Test series were typically lost or drawn. The winning series in 1971 (New Zealand) and 1974 (South Africa) changed this pattern. The last tour of the amateur age took place in 1993. The multi-nation team that is today named the British and Irish Lions first came into existence in 1888 as the Shaw & Shrewsbury Team. It was then primarily English in composition but also contained players from Scotland and Wales. Later the name British Isles became associated with the team. On their 1950 tour of New Zealand and Australia they officially adopted the name British Lions, the nickname first used by British and South African journalists on the 1924 South African tour after the lion emblem on their ties, the emblem on their jerseys having been dropped in favour of the four-quartered badge with the symbols of the four represented unions. When the team first emerged in the nineteenth century, it represented the United Kingdom of Great Britain and Ireland, then one single state. The team continued to exist after the Irish civil war and the subsequent division of Ireland in 1922 into the Irish Free State (later the Republic of Ireland) and Northern Ireland. To avoid ambiguity and possible offence to Irish players, it was later decided to define the team's identity as representing the two sovereign states – the United Kingdom and Ireland – with the team members being either "British" or "Irish". From the 2001 tour of Australia, the official name British and Irish Lions has been used. The team is often referred to simply as the Lions. As the Lions represent two sovereign states, they do not have a national anthem. For the 2005 tour to New Zealand, the Lions management commissioned a song, "The Power of Four", although it met with little support amongst Lions fans at the matches and was not used on the 2009 or 2013 Tours. For more than half a century, the Lions have been synonymous with the red jersey that sports the amalgamated crests of the four unions. However, prior to 1950 the strip went through a number of significantly different formats. In 1888, the promoter of the first expedition to Australia and New Zealand, Arthur Shrewsbury, demanded "something that would be good material and yet take them by storm out here". The result was a jersey in thick red, white and blue hoops, worn above white shorts and dark socks. The tours to South Africa in 1891 and 1896 retained the red, white and blue theme but this time as red and white hooped jerseys and dark blue shorts and socks. The 1899 trip to Australia saw a reversion to red, white and blue jerseys, but with the blue used in thick hoops and the red and white in thin bands. The shorts remained blue, as did the socks although a white flash was added to the latter. The one-off test in 1999 between England and Australia that was played to commemorate Australia's first test against Reverend Matthew Mullineux's British side saw England wear an updated version of this jersey. In 1903, the South Africa tour followed on from the 1896 tour, with red and white hooped jerseys. The slight differences were that the red hoops were slightly thicker than the white (the opposite was true in 1896), and the white flash on the socks introduced in 1899 was partially retained. The Australia of 1904 saw exactly the same kit as in 1899, and it seemed that the British touring sides had settled on kits particular to the host destination. However, in 1908 with the Scottish and Irish unions refusing to be involved, the Anglo-Welsh side only sported red jerseys with a thick white band on their jerseys on tour to Australia and New Zealand. Blue shorts were retained, but the socks were for the first time red, with a white flash. The Scots were once again involved in Dr Tom Smyth's 1910 team to South Africa. Thus, dark blue jerseys, were introduced with white shorts and the red socks of 1908. The jerseys also had a single lion-rampant crest. The 1924 tour returned to South Africa, retaining the blue jerseys but now with shorts to match. It is the 1924 tour that is credited as being the first in which the team were referred to as "the Lions", the irony being that it was on this tour that the single lion-rampant crest was replaced with the forerunner of the four-quartered badge with the symbols of the four represented unions, that is still worn today. Although the lion had been dropped from the jersey, the players had worn the lion motif on their ties as they arrived in South Africa, which led the press and public referring to them as "the Lions". The unofficial  In 1936, the four-quartered badge returned for the tour to Argentina and has remained on the kits ever since, but other than that the strip remained the same. The adoption of the red jersey happened in the 1950 tour. A return to New Zealand was accompanied by a desire to avoid the controversy of 1930 and so red replaced blue for the jersey with the resultant kit being that which is still worn today, the combination of red jersey, white shorts and green and blue socks, representing the four unions. The only additions to the strip since 1950 began appearing in 1993, with the addition of kit suppliers logos in prominent positions. Umbro had in 1989 asked for "maximum brand exposure whenever possible" but this did not affect the kit's appearance. Since then, Nike then Adidas have had more overt branding on the shirts, with sponsors Scottish Provident (1997), NTL (2001), Zurich (2005) and HSBC (2009 & 2013). 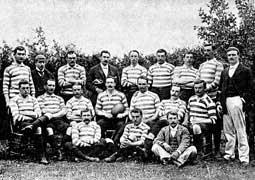 Shaw & Shrewsbury Team, 1888, The first British or Irish touring rugby team, a private-enterprise trip to Australia and New Zealand. 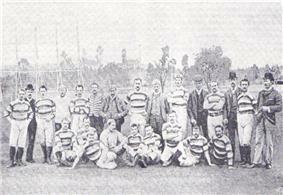 Despite its label as an England side, the team which toured South Africa in 1891 contained several Scots. England v Cape Colony, 1891. The first match of the Bill MacLagan undefeated tour of South Africa. The earliest tours date back to 1888, when a 21-man squad visited Australia and New Zealand. The squad drew players from England, Scotland and Wales, though English players predominated. The 35-match tour of two host nations included no tests, but the side played provincial, city and academic sides, winning 27 matches. They played 19 games of Australian rules football, against prominent clubs in Victoria and South Australia, winning six and drawing one of these (see Australian rules football in England). The first tour, although unsanctioned by rugby bodies, established the concept of Northern Hemisphere sporting sides touring to the Southern Hemisphere. Three years after the first tour, the Western Province union invited rugby bodies in Britain to tour South Africa. Some saw the 1891 team – the first sanctioned by the Rugby Football Union – as the English national team, though others referred to it as "the British Isles". The tourists played a total of twenty matches, three of them tests. The team also played the regional side of South Africa (South Africa did not exist as a political unit in 1891), winning all three matches. In a notable event of the tour, the touring side presented the Currie Cup to Griqualand West, the province they thought produced the best performance on the tour. Five years later a British Isles side returned to South Africa. They played one extra match on this tour, making the total of 21 games, including four tests against South Africa, with the British Isles winning three of them. The squad had a notable Irish orientation, with the Irish national team contributing six players to the 21-man squad. In 1899 the British Isles touring side returned to Australia for the first time since the unofficial tour of 1888. The squad of 23 for the first time ever had players from each of the home nations. The team again participated in 21 matches, playing state teams as well as northern Queensland sides and Victorian teams. A four-test series took place against Australia, the tourists winning three out of the four. The team returned via Hawaii and Canada playing additional games on route. Four years later, in 1903, the British and Irish team returned to South Africa. The opening performance of the side proved disappointing from the tourists' point of view, with defeats in its opening three matches by Western Province sides in Cape Town. From then on the team experienced mixed results, though more wins than losses. The side lost the test series to South Africa, drawing twice, but with the South Africans winning the decider 8 to nil. No more than twelve months passed before the British and Irish team ventured to Australia and New Zealand in 1904. The tourists devastated the Australian teams, winning every single game. Australia also lost all three tests to the visitors, even getting held to a standstill in two of the three games. Though the New Zealand leg of the tour did not take long in comparison to the number of Australian games, the British and Irish experienced considerable difficulty across the Tasman after whitewashing the Australians. The team managed two early wins before losing the test to New Zealand and only winning one more game as well as drawing once. Despite their difficulties in New Zealand, the tour proved a raging success on-field for the British and Irish. In 1908, another tour took place to Australia and New Zealand. In a reversal of previous practice, the planners allocated more matches in New Zealand rather than in Australia: perhaps the strength of the New Zealand teams and the heavy defeats of all Australian teams on the previous tour influenced this decision. Some commentators thought that this tour hoped to reach out to rugby communities in Australia, as rugby league (infamously) started in Australia in 1908. The Anglo-Welsh side (Irish and Scottish unions did not participate) performed well in all the non-test matches, but drew a test against New Zealand and lost the other two. 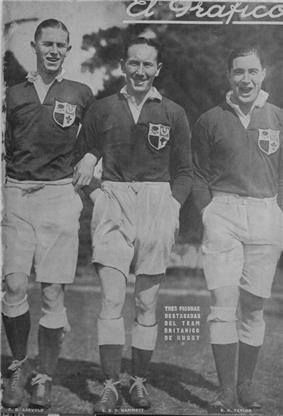 Three members of the team that toured on Argentina in 1927. Visits that took place before the 1910 South Africa tour (the first selected by a committee from the four Home Unions) had enjoyed a growing degree of support from the authorities, although only one of these included representatives of all four nations. 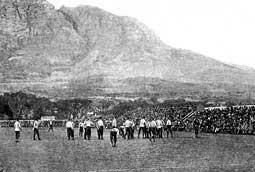 The 1910 tour to South Africa marked the official beginning of British and Irish rugby tours: the inaugural tour operating under all four unions. The team performed moderately against the non-test parties, claiming victories in just over half their matches. The test series, however, went to South Africa, who won two of the three games. A side managed by Oxford University — supposedly the England rugby team, but actually including three Scottish players — toured Argentina at the time: the people of Argentina termed it the "Combined British". The next British Isles team tour did not take place until 1924, again in South Africa. The team, led by Ronald Cove-Smith, struggled with injuries and lost three of the four test matches, drawing the other 3–3. In total, 21 games were played, with the touring side winning 9, drawing 3 and losing 9. This tour may have marked the occasion when the team first became known as "the Lions". In 1927 a short, nine-game series took place in Argentina, with the Lions winning all nine encounters; the tour did however become a financial success for Argentine rugby. After a seemingly long absence from New Zealand, the Lions returned in 1930 to some success. The Lions won all of their games that did not have test status except for the matches against Auckland, Wellington and Canterbury; they did however lose three of their four test matches against New Zealand, winning the first test 6–3. The side also visited Australia, losing a test but winning five out of the six non-test games. In 1936 the Lions visited Argentina for the second time, winning all ten of their matches and only conceding nine points in the whole tour. Two years later the Lions toured in South Africa, winning more than half of their normal matches. Despite having lost the test series to South Africa by game three, the Lions won the final test. The first post-war tour went to New Zealand and Australia in 1950. The Lions, sporting newly redesigned jerseys and displaying a fresh style of play, managed to win 22 and draw one of 29 matches over the two nations. The Lions won the opening four fixtures before losing to Otago and Southland, but succeeded in holding the All Blacks to a 9–9 draw. The Lions performed well in the remaining All Black tests though they lost all three, the team did not lose another non-test in the New Zealand leg of the tour. The Lions won all their games in Australia except for their final fixture against a New South Wales XV in Newcastle. They won both tests against Australia, in Brisbane, Queensland and in Sydney. In 1955 the Lions toured South Africa and left with another imposing record, one draw and 19 wins from the 25 fixtures. The four-test series against South Africa, a thrilling affair, ended in a drawn series. The 1959 tour to Australia and New Zealand marked once again a very successful tour for the Lions, who only lost six of their 35 fixtures. The Lions easily won both tests against Australia and lost the first three tests against the All Blacks, but did find victory (9–6) in the final test. After the glittering decade of the 1950s, the first tour of the 1960s proved not nearly as successful as previous ones. The 1962 tour to South Africa saw the Lions still win 16 of their 25 games, but did not fare well against the Springboks, losing three of the four tests. For the 1966 tour to Australia and New Zealand John Robins became the first Lions Coach, and the trip started off very well for the Lions, who stormed through Australia, winning five non-tests and drawing one; and most notably defeating Australia in two tests as well. The Lions however experienced mixed results during the New Zealand leg of the tour, as well as losing all of the tests against the All Blacks. The Lions also played a test against Canada on their way home, winning 19 to 8 in Toronto. The 1968 tour of South Africa saw the Lions win 15 of their 16 provincial matches, but the team actually lost three tests against the Springboks and drew one. The 1970s saw a renaissance for the Lions. The 1971 team, centred around the skilled Welsh half-back pairing of Gareth Edwards and Barry John, secured a series win over the All Blacks. The tour started with a loss to Queensland but proceeded to storm through the next provincial fixtures, winning 11 games in a row. The Lions then went on to defeat the All Blacks in Dunedin. The Lions would only lose a single match on the rest of the tour, and won the test series against New Zealand, winning and drawing the last two games, to take the series two wins to one. One of the best-known and most successful Lions team toured South Africa in 1974 under the esteemed Irish forward Willie John McBride. It went through 22 games unbeaten, and triumphed 3–0 (with one drawn) in the test open series. The test series featured a lot of violence. The management of the Lions concluded that the Springboks dominated their opponents with physical aggression. At that time, test match referees came from the home nation, substitutions took place only if a doctor found a player unable to continue and there were no video cameras or sideline officials to prevent violent play. The Lions decided "to get their retaliation in first" with the infamous "99 call". The Lions postulated that a South African referee would probably not send off all of the Lions if they all retaliated against "blatant thuggery". Famous video footage of the 'battle of Boet Erasmus Stadium' shows JPR Williams running over half of the pitch and launching himself at Van Heerden after such a call. The 1977 tour to New Zealand saw the Lions drop only one non-test out of 21 games, a loss to a Universities side. The team did not win the test series though, winning one game but losing the other three. In August 1977 the British Lions made a stopover in Fiji on the way home from their tour of New Zealand. Fiji beat them 25–21 at Buckhurst Park, Suva. The Lions toured South Africa in 1980. The team completed a flawless non-test record, winning 14 out of 14 non-test matches on the tour. The Lions did however lose the first three tests to South Africa, winning the last one, though the series had already been won by the Springboks. The  The Lions tour to Australia in 1989 was a short affair, being only 12 matches in total. The tour was very successful for the Lions, who won all eight non-tests and won the test series against Australia, two to one. The Lions tour to New Zealand in 1993 was the last of the amateur era. The tourists won six and lost four non-test matches, and lost the test series 2–1. The tour to South Africa in 1997 was a success for the Lions, who completed the tour with only two losses. The Lions won the test series 2–1. In 2001, the ten game tour to Australia, saw the Wallabies win the test series 2–1. This series saw the first award of the Tom Richards Trophy. The Lions' 2005 tour to New Zealand, coached by 2003 England world cup winning coach Clive Woodward, won all seven games against provincial teams however suffered heavy defeats in all three tests and were narrowly defeated by the New Zealand Maori team. The Lions faced the World Cup winners South Africa, with Ian McGeechan leading a coaching team including Warren Gatland, Shaun Edwards and Rob Howley. The Lions were captained by Irish lock Paul O'Connell. The initial Lions selection consisted of fourteen Irish players, thirteen Welsh, eight English and two Scots in the 37-man squad. In the first Test on 20 June, they lost 26–21, and lost the series in the second 28–25 in a tightly-fought game at Loftus Versfeld on 27 June. The Lions won the third Test 28–9 at Ellis Park, and the series finished 2–1 to South Africa. During June 2013 the British and Irish Lions toured Australia. Former Scotland and Lions full-back Andy Irvine was appointed as tour manager in 2010. The tour started in Hong Kong with a match against the Barbarians before moving on to Australia for the main tour featuring six provincial matches and three tests. The next British and Irish Lions tour will be to New Zealand in 2017. The current agreement with the SANZAR Nations runs out after the New Zealand tour and negotiations will begin in 2014 on a new one which promises to be markedly different because of the explosion of interest in the Lions. It has been stated that everything will be up for discussion, from the financial side to scheduling, itineraries, the strength of opposition in warm-up matches and the number of matches played. Following the performances of the Canadian, American and Argentine teams at the 2011 Rugby World Cup, some commentators have suggested the Lions conduct a shortened tour of the Americas in the future. The Lions currently tour three southern hemisphere nations; Australia, South Africa and New Zealand. They also routinely toured in Argentina before World War II. Tours currently take place every four years. The most recent tour visited Australia in June–July 2013, and before that the Lions toured South Africa in 2009. In a break with tradition, a "home" fixture against Argentina took place at Millennium Stadium in Cardiff on 23 May 2005, before the Lions went to New Zealand. It finished in a draw, 25–25. On tour, games take place against local provinces, clubs or representative sides as well as the full tests against the host's national team. 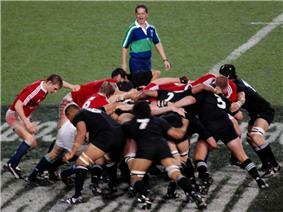 The Lions, and their predecessor teams, have often played games against other nearby countries on tour. For example, they played Rhodesia (the future Zimbabwe) in 1910, 1924, 1938, 1955, 1962, 1968 & 1974 during their tours to South Africa. They also were beaten by Fiji on their 1977 tour to New Zealand. In addition, they toured pre-independence Namibia (then South West Africa), in 1955, 1962, 1968, and 1974. There have also been games in other countries on the way home. These include games in Canada in 1959 and 1966, East Africa (then mostly Kenya, and held in Nairobi), and an unofficial game against Ceylon (future Sri Lanka) in 1950. Previous tours have seen some non-Test players become demotivated, but more recently this issue has reduced because of high injury rates, increased use of replacements and greater selection flexibility. In recent tours a common issue has been weak opposition in many non-Test games, partly as opposition countries have their top players in national training camps, partly as sides protect top players for domestic games which are seen as more commercially important than Lions games, and possibly partly to prevent the Lions having high standard preparatory games. The Lions played an unofficial international match in 1955 at Cardiff Arms Park against a Welsh XV to mark the 75th anniversary of the Welsh Rugby Union. The Lions won 20–17 but did not include all the big names of the 1955 tour, such as Tony O'Reilly, Jeff Butterfield, Phil Davies, Dickie Jeeps, Bryn Meredith and Jim Greenwood, but was not bereft of great internationals such as the Newport wing Ken Jones who toured New Zealand with the Lions in 1950. In 1977, the Lions played their first official home game, against the Barbarians as a charity fund-raiser held as part of the Queen's silver jubilee celebrations. The Baa-Baas line-up featured JPR Williams, Gerald Davies, Gareth Edwards, Jean-Pierre Rives and Jean-Claude Skrela. The Lions included 13 of the team which played in the fourth test vs New Zealand three weeks before and won 23–14. In 1986, a match was organised against a Rest of the World XV as both a warm-up to the 1986 South Africa tour, which was subsequently cancelled, and as a celebration match to mark the International Rugby Board's centenary. The Lions lost 15–7, but never toured. In 1989, Rob Andrew captained the Lions in their victory against France in Paris. The game formed part of the celebrations of the bi-centennial of the French Revolution. The Lions won 29–27. In 1990, a team titled the "Four Home Unions" was put together to play the "Rest of Europe XV". This was a match to raise money for the rebuilding of Romania following the overthrow of Nicolae Ceauşescu in December 1989. The team's logo was that used by the Lions, i.e. the crests of the four home unions united in a shield. The Rest of Europe played under the symbol of the Federaţia Română de Rugby. ^ Griffiths (1987), pg 9:3. ^ Griffiths (1987), pg 9:6. ^ a b Godwin (1981), pg 231. ^ Griffiths (1987), pg 9–8.